According to a team of researchers from the University of Georgia's Savannah River Ecology Laboratory, the disappearance of two amphibian species, which include the southern leopard frog and the southern toad, may be accelerated by the effects of copper-contaminated wetlands and climate change. Scott Weir, a postdoctoral researcher who headed the study titled "Integrating copper toxicity and climate change to understand extinction risk to two species of pond-breeding anurans”, stated that copper is naturally available in aquatic environments, and it facilitates physiological processes to a certain extent. However, copper is found to be toxic at higher levels. Seasonal wetlands, the breeding grounds for amphibians, are very often found to have copper and a variety of other contaminants due to runoff from roads and industrial activities. The researchers collected data showing the warming trends existing in the Southeastern U.S., which is the habitat of the two amphibians. They then discovered the need to examine the combined effects of climate change and copper contamination. Studies often examine the impact of single environmental stressors on a species, but, in reality, a species is often hit by several stressors at once. It could be multiple types of pollutants or, in this case, a metal pollutant that accumulates in wetlands along with wetland habitat changes associated with climate change. Weir stated that besides the copper contamination, the frequent occurrence of catastrophic reproductive failure can also be increased by climate change. Climate change may cause the ponds to dry too early. When this happens the tadpoles born that year are unable to metamorphose and get out of the pond, so they die. We refer to this as catastrophic reproductive failure. The study results are featured in the journal, Ecological Applications. These results highlight that at different levels for each of the two species, the combined and separate effects of climate change and copper can increase the possibility of population extinction, which according to Lance and Weir is an occurrence of a population minimized to less than 10 adult females. The researchers delivered these quantifiable results by developing female breeding models for each of the amphibians based on historical data obtained from Rainbow Bay, a seasonal wetland in South Carolina where research on amphibians has been executed by UGA since 1978. What is unique about this study is the amount of empirical data. It is incredibly rare to have accurate life history estimates from a 37-year long-term field study as well as data from lab experiments on both embryos and larvae that can be integrated into the model. The researchers carried out 1,000 simulations for a 50-year period. Simulated populations were allowed to exist for a period of 15 years before the addition of copper. The risk of extinction was not present when copper levels were found to be low in the southern toad, at 15 parts per billion, and also during the absence of catastrophic reproductive failure. The risk of extinction occurred when copper was found to be at higher levels—at 30 parts per billion or greater. It doesn't take much. The amounts of copper that are safe for humans in drinking water can be lethal to amphibians due to a higher sensitivity. Weir further explained that frogs were comparatively found to be more tolerant of copper than toads were. Extinction in frogs was not caused by copper during the absence of a disastrous reproductive failure. At 100 parts per billion, populations were able to continue for 50 years. The presence of the two stressors in the frogs increased the probability of extinction risk. However, this was different in the case of toads, which were affected by the lower levels of copper. This is a critical point. It's not enough to do single stressor studies and add up the combined effects—some effects are synergistic. Catastrophic reproductive failure, which is due to climate change, greatly influenced both the amphibian species in comparison to the impact brought by low to moderate amounts of copper. Weir stated that the existing climate models are capable of predicting changes in precipitation patterns and temperature that could lead to disastrous catastrophic reproductive failure frequencies between 10 to 40% or even more. This frequent reproductive failure could represent an extinction tipping point for some species. If leopard frogs suffer complete reproductive failure once every three years, that population has a 63 percent chance of extinction. For toads, that percentage is about 25 percent. 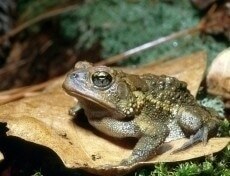 Lance and Weir pointed out that the research has implications for all amphibians. Most people aren't aware that different species of amphibians need wetlands with different hydroperiods, the amount of time a wetland holds water. The influence that climate change is having on wetlands is of great concern for amphibians, which are already facing global declines. The researchers further stated that it is possible to turn around this forecast if industries reduce the use of copper. Additional study researchers include Christopher Salice of Towson University in Maryland and David E. Scott of the UGA Savannah River Ecology Laboratory.